Heat a gas or wood fired grill to a medium heat. Dress onion steaks with olive oil, salt and pepper. Grill until cooked and tender. Toast onion rolls on grill. 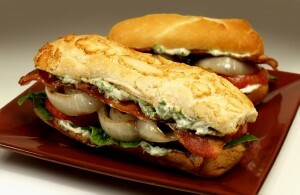 Assemble sandwich, dress bun (top and bottom) with 1 1/2 tablespoon of arugula mayonnaise, place romaine spear, grilled onion, bacon, sliced tomato, season with pinch of salt and pepper; top of onion roll. Press slightly to “mash” the flavors together and enjoy! 4 each Walla Walla Onion Steaks, peeled and sliced into ring approx. 1/2 inch thick. Combine ingredients in food processor and blend smooth. Reserve for use. Combine all ingredients and let stand for 30 minutes. Serve. Combine first 5 ingredients in shallow dish; add scallops and fruit zest. Chill 2-3 hours. Serve. Caramelized Walla Walla River Sweet Onions and sweet corn combined in a light batter and deep fried to a golden brown, topped with honey and powdered sugar. Walla Walla River Sweet Onions, sun-dried tomatoes, apricot, peppers and pecans make this a flavor-packed starter. In a pan lightly sauté onions; add apricots, peppers, tomatoes and pecans. Cook 2 minutes. In small bowl mix cream cheese and preserves; spread baguette slices and top with warm confetti mixture and lemon juice. Garnish with fresh chopped basil. Lightly caramelized Walla Walla River Sweet Onions make this spread great served with crackers and raw vegetables. Sauté onion 8-10 minutes on medium-high heat to lightly caramelize; add garlic and cool. Combine all ingredients in food processor and blend. Sweet Onion Spread can be stored in the refrigerator for up to 2 weeks. Serve with crackers or raw vegetables. Yield:1 1/2 cup. Brush onion slabs with oil and salt and pepper on both sides. Grill turning once, 10-12 minutes until just tender. Remove to cutting board and cut into large dice. In bowl, combine tomatoes, onions, vinegar, oil and basil. Garnish with cheese. Walla Walla River Sweet Onions, peaches and pecans in a raspberry vinaigrette……all we need is Ray Charles! Sauté pecans in butter and brown sugar for 5 minutes. In a bowl toss greens with vinaigrette. Place greens on a serving plate topped with onions, peaches, raspberries and warm pecans. Drizzle with more dressing and garnish with a slice of goat cheese. Yield: 4-6 salads. Truly a match made in heaven! 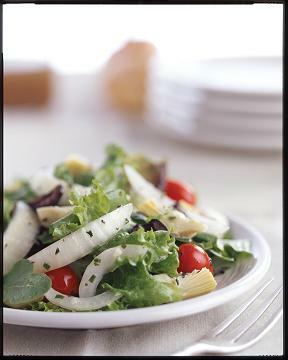 The delicate flavors of Walla Walla River Sweet Onions, artichokes hearts and basil on a bed of field fresh baby greens. 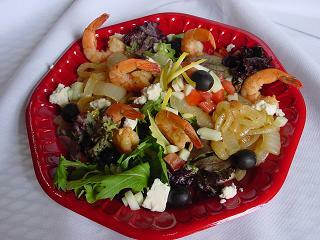 For Salad; In a bowl combine all ingredients and toss with vinaigrette. Note; marinade artichoke hearts in 1/3 cup of vinaigrette dressing for 1 hour. Blanche asparagus 1 minute in boiling water; place in ice bath. Remove and dry. Combine all ingredients, toss and serve on platter. Walla Walla River Sweet Onions and roasted beets with dill are a delightful light salad that’s unexpected. On platter, combine greens, onions and dressing; toss. Top with berries, cheese, pecans and orange zest. Walla Walla River Sweet Onions, red bell pepper and black olives compliment cheese tortellini, chilled and lightly tossed in our house vinaigrette. Cook tortellini and cool. In a bowl combine pasta, vegetables, olives and vinaigrette. Garnish with fresh basil. Combine all ingredients and serve. Serves 6 or more. Walla Walla River Sweet Onions and their delicate, sweet flavor shine in this light bisque. In a stock pot add butter, onions and cook until tender. Add flour and blend into onion mixture; add stock and water. Bring to boil and reduce heat to simmer for 30 minutes. Add cream, salt/pepper and garnish with fresh parsley. Yield 8-10 servings. To pan add olive oil, onions, peppers, garlic and mushrooms; sauté 5-7 minutes; add beans, cook 5 minutes. Combine all ingredients in food processor and puree. Season with salt and pepper. Serve well chilled. Walla Walla River Sweet Onions are the star of the show here nicely paired with fresh basil and parsley. Assembly: On 4 slices of bread spread the sauce, then a layer of sweet onion, bell pepper and a sprinkle of fresh herbs; repeat onion, pepper and herbs. Top with tomato and red leaf lettuce and spread another piece of bread with the sauce and cover. Walla Walla River Sweet Onions and the flavor of mesquite, chicken, smokey bacon, and pepper jack cheese is a cowboy’s delight. Grill chicken and onions brushed with olive oil, salt and pepper over mesquite wood coals. Assembly: In softened tortilla place chopped chicken and onion, lettuce, tomato, jalapeño and pepper jack cheese. 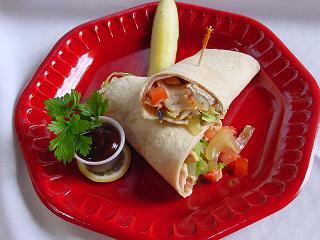 Roll burrito style, cut in half, pick and serve with a spicy bar-b-que sauce. Saute shrimp and onions until cooked. Assemble sandwich and place in Panini maker until nicely browned and the cheese is melted. Walla Walla River Sweet Onions coupled with mango, kiwi, mandarin orange, sweet bell pepper and pork, served with a spicy Asian dipping sauce will have you looking for a tropical beach. Sauté onions and peppers and keep warm. Toss pork with bar-b-que sauce and warm. In a bowl, place fruit and toss with lime juice and cilantro. On softened tortilla place pork, sweet onions, peppers; top with fruit mixture and roll burrito style, cut in half, pick, garnish with toasted coconut and serve with a spicy Asian dipping sauce. Walla Walla River Sweet Onions and portobella mushrooms are sautéed with garlic then finished in Marsala wine then placed on a succulent, juicy center-cut filet mignon. Walla Walla River Sweet Onions, black olives, oregano, garlic, tomato and shrimp are baked then topped with feta cheese and cracked black pepper. In a pan, add oil, garlic and onions; caramelize and keep warm. In ramekins, layer onion, shrimp, oregano and olives; repeat. Bake 8-10 minutes or until shrimp are cooked. Top with feta, tomato, black pepper and lemon juice. Walla Walla River Sweet Onions and Mahi-Mahi, gently grilled then topped with a light parsley butter sauce for a taste of the Florida Keys. 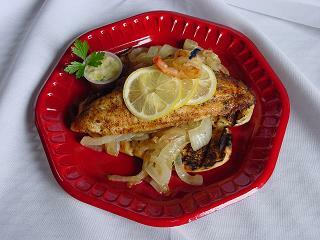 Grill onions and mahi-mahi and then keep warm. In sauce pan, add wine and reduce by half, add butter, then parsley and remove from heat when combined. Plate and sauce fish atop the grilled onion slabs (which should be separated and mounded) and garnish with lemon. Cook pasta; keep warm. In oil, saute onion 5-7 minutes; remove and keep warm. Deglaze pan with white wine, add cream and reduce by half; add horseradish, pasta and onion to warm through. Salmon can be poached or grilled then flaked for plating. Place pasta and onions on plate; top with salmon and sauce. Garnish with parmesan cheese and parsley. Caramelized Walla Walla River Sweet Onions are mashed with red potatoes, parmesan, ricotta and brushed with garlic butter then baked to a golden brown. In a pot boil the potatoes with skin-on. In a pan caramelize the onions in oil. Melt 5T butter with garlic to brush on top of potato mixture. Combine potatoes, cream, cheese and onions then mash (should be a bit chunky). Place potato mixture in large baking dish or ramekins and bake at 400 degrees until golden brown on top. Dust with paprika. Walla Walla River Sweet Onions sautéed with baby Yukon Gold potatoes are splashed with red wine vinegar and topped with fresh rosemary and thyme. Boil potatoes to al dente; cool and halve. In pan, sauté onions, garlic and potatoes. When cooked, sprinkle with vinegar, salt, pepper and fresh herbs and then toss. Coat asparagus with oil, salt and pepper. Grill asparagus over medium high heat 2-3 minutes, flip, cook 2-3 minutes more or until desired doneness. Remove to platter, drizzle with vinaigrette, salt, pepper and chopped fresh herbs for garnish. Walla Walla River Sweet Onions, zucchini, asparagus, fennel and baby red potatoes, grilled then tossed with basil vinaigrette and grated parmesan cheese….a house favorite! Slice vegetables and brush with olive oil, salt and pepper. Grill until tender and toss with vinegar and top with cheese. Coat asparagus and Walla Walla River Sweet Onions with oil, salt and pepper. Grill over medium-heat until desired doneness; remove from heat to platter. In bowl, combine oil, zest,orange juice, lemon juice, salt and pepper. Drizzle over grilled vegetables and top with orange segments. Walla Walla River Sweet Onions show-off their sweetness in this classic scalloped onion dish. Boil onions until tender and then drain. In a baking dish layer onions, butter, crackers, salt and pepper. Pour milk and egg mixture over the top; sprinkle with buttered bread crumbs and bake at 350 for 20 minutes. Garnish with parsley. In a bowl combine all ingredients, toss and enjoy. Yield: 4-5 cups. Walla Walla River Sweet Onions, fresh peaches, apples, allspice, and cinnamon makes a great topper on grilled baby back ribs or chicken. Combine all ingredients in bowl and serve. Great salsa to serve with grill pork tenderloin, baby back ribs, chicken and fish.